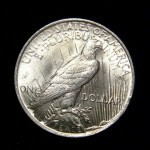 If you are looking for the best value and lowest prices for 1923 Peace silver dollar coins, we have posted several listings for these silver coins from online dealers. These American collectible coins were minted in Philadelphia, Denver, and San Francisco. You can identify their mint by looking on the tail side the coin. The Peace silver coins minted in Denver has a "D" mark whereas the ones minted in San Francisco mint has an "S" mark. The coins struck in Philadelphia do not have a mint mark on the tail. Our sale listings update in real time and change daily so come back to see what new coin offers are available for sale. 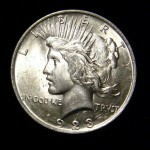 In 1923, a large quantity of these silver dollar coins were struck. About 30,800,000 were Philadelphia Mint, 6,811,000 were Denver Mint, and 19,020,000 were San Francisco Mint. You can purchase either circulated or uncirculated silver dollars, which make a better investment since they are valued more. This entry was posted in US Coin Collecting. Bookmark the permalink.